Sun, Apr 21, 2019, 0:53:05 ---- The fact: 42.844.000 visitors done. To save time and money in the welding of large diameter metal tubes pipes, two new grades of weld backing tape are available. 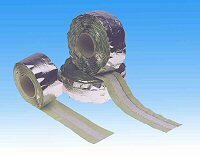 The Argweld backing tapes comprise a 75 mm wide strip of heat resistant adhesive aluminium foil, down the centre of which is a 25 mm wide band of woven glass fibre cloth. A lightweight grade for welding up to 80 Amps comes in 25 metre lengths and the heavy duty version suits welding up to 160 Amps and is available in 12 1/2 metre rolls. By affixing the adhesive tape to the backside of joints to be welded, the weld zone is completely and effectively blocked off. Single sided TIG, MMA, MIG or plasma welding can then be undertaken from the outside, with the shield gas from the welding torch providing gas coverage to the root of the weld. Advantages of backing tape usage include savings of considerable expense in manufacturing back purge tooling, savings in waiting time for purging, elimination of costly back-gouging and double sided welding techniques and reduction in weld defect. The weld metal is cast onto the glass fibre tape, leaving a flat, pore and crevice free weld which requires only the minimum of cleaning.